One of the challenges of cloud computing is effective resource management due to its auto-scaling feature. Prediction techniques have been proposed for cloud computing to improve cloud resource management. 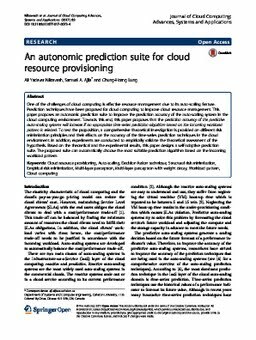 This paper proposes an autonomic prediction suite to improve the prediction accuracy of the auto-scaling system in the cloud computing environment. Towards this end, this paper proposes that the prediction accuracy of the predictive auto-scaling systems will increase if an appropriate time-series prediction algorithm based on the incoming workload pattern is selected. To test the proposition, a comprehensive theoretical investigation is provided on different risk minimization principles and their effects on the accuracy of the time-series prediction techniques in the cloud environment. In addition, experiments are conducted to empirically validate the theoretical assessment of the hypothesis. Based on the theoretical and the experimental results, this paper designs a self-adaptive prediction suite. The proposed suite can automatically choose the most suitable prediction algorithm based on the incoming workload pattern.